If your new year resolution is to improve your betting in 2017, then make sure you check out the very latest Tipster Profit Report — available now for immediate download. 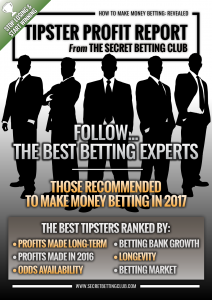 Inside this brand new report, you can read our independent rankings, reviews and ratings on the best betting experts recommended to you to make money betting in 2017. And with our specially discounted 2017 prices (Whereby you can save up to £35 on the cost of an SBC membership), its a great time to see how we can help your betting! > Detailed Ratings On Every Tipster: Each of the tipsters we track has its own designated Key Facts Page with 10 different ratings on everything from cost to customer service and profitability. > Massive Tipster Discounts: You can save £££’s on the cost of joining many popular tipsters through the special deals we negotiate on your behalf. Many of which are exclusive to the Smart Betting Club. > Back Catalogue Access: As 2017 is our eleventh year of service, you can access our entire back catalogue of past reports and tipster reviews. If we haven’t reviewed a tipster, it probably isn’t worth knowing about. And all from the only 100% independent tipster source! Yes, that’s right as whilst all other review sites use affiliate links or make money referring sales to the tipsters, all SBC tipster reviews and ratings are 100% independent and affiliate-free. So when we say a tipster is good, it’s because it genuinely is! Save Up To £35 On An SBC Membership! You can pick up your copy of the latest Tipster Profit Report, the instant you join our service at the Smart Betting Club with full access to our exclusive members-only area. Best of all, you can now join and save up to £35 as part of our specially discounted 2017 membership prices. This entry was posted in Tipster Profit Report and tagged finding the best tipsters, the best football tipsters, the best long-term tipster, the best racing tipster, the best tipster of 2016, tipster reviews, tipster tables. Bookmark the permalink.